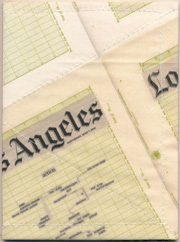 Jen Hofer’s new chapbook Front Page News, a series of newspaper cut-ups clipped from the front page of the Los Angeles Times, leads its readers through a recitation of the matter-of-fact violence that characterizes the pages of newspapers everywhere. 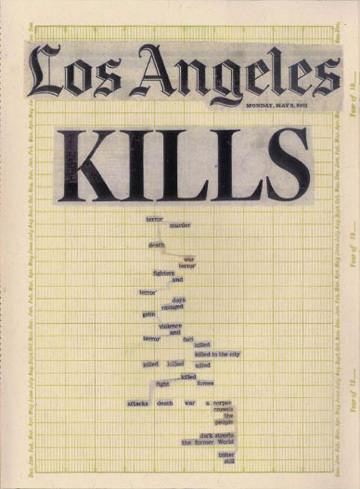 Part of a longer manuscript which Hofer composed each day over the course of a year, using the front page of the newspaper of whichever city she woke up in, the pages of Front Page News are taken from a fifteen-day period in Los Angeles, where Hofer resides. These cut-ups, held together by careful clipping to include a connective tissue of the white space of the paper, crack open reportage to create new texts that call into stark relief the sensationalized, quotidian violence of the newspaper writings from which they are composed. In this poem, Hofer calls out the hyperbolic principle of newspaper headlines and storylines, with their subtext—a response to the pressure of selling ad-copy and getting eyes-on-pages—being what sells: “a corpse / crowds / the / people.” A corpse, indeed, is what passes for news. In the poem dated Sunday, April 24, 2011, Hofer tenders a compressed moment for the inhabitants of Chernobyl, post-nuclear meltdown. The poet pushes the source material beyond “human interest” or environmental reporting, past even headline fascinations with war, death, and disaster. In the compression of language and syntax, Hofer transforms the abstraction of news (always happening elsewhere to someone else) and returns to it the immediacy of people caught in the midst of life’s exigencies: “in radioactive / breath / we eat / we drink / trying . . . the years were / a casket.” For a moment, in the midst of these lines, “we” are caught in the toxic air, our feet planted on the contaminated ground, our lives reduced to the relenting countdown of an atomic clock. As an object, the chapbook owes much to the contribution of publisher Dawn Pendergast at Little Red Leaves. Using several of Hofer’s collages printed on cloth as a cover, Pendergast has sewn the chapbook together by machine, mimicking the mechanical processes of printing newspapers yet, like Hofer, bringing it back to the immediate and personal, one woman feeding the cloth beneath pressure-foot and needle. It is thus a pleasure to hold and admire, as well as to read. Political, ambitious, visual, and compact, Jen Hofer’s Front Page News pulls its readers out of quotidian distraction and into a heated cynosure, the clipped, cryptic language reconfiguring the blatant emotional manipulation of news media and our own hunger for its “sizzurp.” It’s a remarkable collection, and makes one long for the full-length manuscript to find its way into print soon.